Construction delays due to weather have extended the completion of the Stamps fields, known to many students as the SAC fields, to the spring semester. The project, replacing the Stamps fields turf and underlying drainage system was originally scheduled to be completed sometime between Oct. 1 and early January. 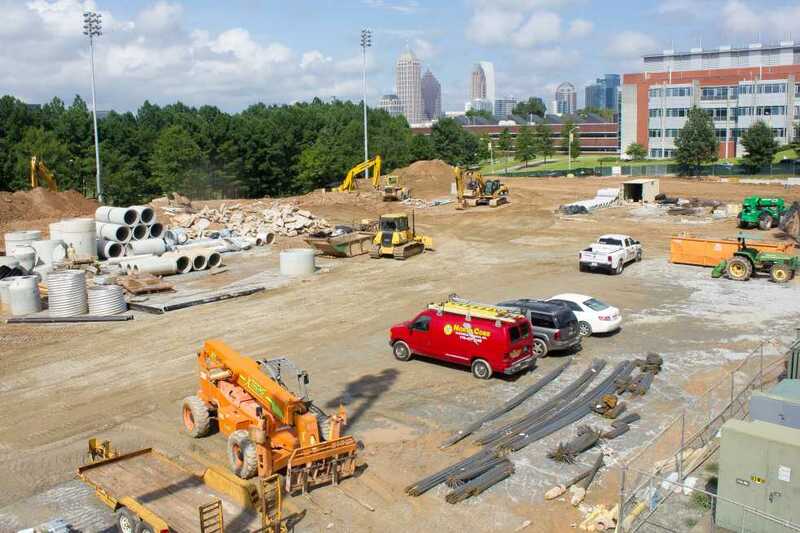 Because of the unexpected amount of rain during the summer when the bulk of the construction was expected to be done, the Campus Recreation Center (CRC) announced that the project would be completed by the later estimate. “We have said from the beginning that the best case scenario would be the first of October [and] the worst case scenario would be the start of the spring semester,” said Mike Edwards, Director of the CRC. The delay has necessarily altered the intramural schedule as sports such as soccer and flag football are usually held in the fall. It has also disrupted club sports and individual students who relied on the fields during the fall. To accommodate intramurals, the CRC has altered the schedule, moving many of the sports that used the fields during fall to the Spring and canceling two of the sports. “We looked at the year and because of how the outdoor space is used, and there are two sports that had to kind of get discussed and… at this point, they’re not going to be available,” said Dan Hazlet, Assistant Director of Intramurals. Softball and the four-on-four version of flag football are currently not on the intramural schedule due to the limited availability of the fields. The full seven-on-seven flag football will be offered and the CRC is currently looking at off-site options for softball. The Burger Bowl has been the substitute for most students. Construction delays were triggered by the unusual amount of rain experienced in Atlanta during the summer months. According to the National Weather Service Weather Forecast Office, the rainfall in Atlanta for the months of May, June and July was 23.31 inches compared to the 30 year average of 12.88 inches. Another consequence of the delays is the funding for the project. Although the project had what is called a Guaranteed Maximum Price which guarantees that the CRC will not pay more than a set amount for the project, the delays have cut into the contingency money used for unforeseen costs. “We had hoped that there would be some contingency left so that we could add things back into the project and that does not appear to be the case,” said Edwards.